For more than a quarter-century, the Bourgogne Wine Board (BIVB) has been to wine tourism, and in particular through two key tools : The “De Vignes en Caves” welcome charter, created in 1991; and the “En Route vers les Bourgognes” guide.The “A trip through the vines” section of the Bourgogne Wines website completes the service, enabling you to plan the perfect trip ! 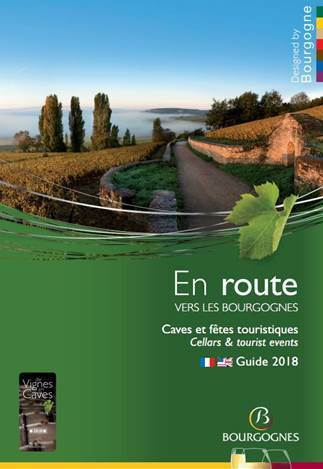 The “En Route vers les Bourgognes” guide was designed to facilitate planning your trip with six tourist trails through the vines. The 2018 edition lists even more producers and wine-related celebrations that ever before, proving that wine tourism is anything but a passing fad, and is a confirmed trend in the Bourgogne winegrowing region. The 2018 guide in figures.The details of 363 estates, producers, and cooperative cellars that have signed up to the “De Vignes en Caves*” welcome charter, listing languages spoken, opening hours, price ranges, accommodation and food options, and details of organic producers.100 wine-related events throughout the year are listed in a calendar at the end of the guide. A map of the Bourgogne winegrowing region listing key sites to visit across the region, with smaller maps of each wine route on the back. Produced in partnership with the Bourgogne-Franche-Comté tourist board. Tagged with: Frankrijk, Bourgogne, Oenotourisme.